The African Region faces a high demand for blood transfusion due to bleeding related to pregnancy and childbirth, high prevalence of malaria with the attendant complication of severe malarial anemia, high rates of road traffic accidents and other types of injury as well as other indications for blood transfusion. Ensuring universal access of all the population to a safe blood supply faces a number of challenges in the region. These include a high burden of disease transmissible through blood transfusion, including HIV, HBV, HCV and syphilis; posing difficulties in selecting donors at reduced risk of infection, unstable economies, lack of suitable infrastructure to provide blood services, inadequate human resources as well as lack of conducive career development structures for BTS staff in many member states. Reliance on family replacement donations, limited coverage and quality of testing, inappropriate blood transfusion and poorly developed quality systems pose additional challenges. Most countries have developed their national blood policies and plan, 73% of total blood collections are from voluntary blood donors, at least 98% of the blood is screened for HIV, 89% for HBV, and about 60% for HCV. Thirty eight countries in the African Region report collecting fewer than 10 donations per 1000 population. There is a constant need for regular blood because it can only be stored for a limited time before use. Regular blood donations by a sufficient number of healthy people are needed to ensure that safe blood will be available whenever and wherever it is needed. 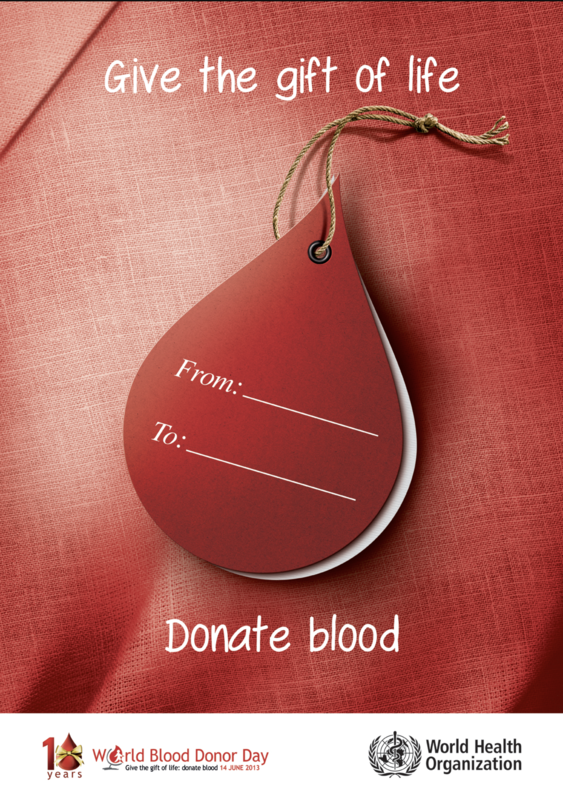 More than 50% of the blood supply is still dependent on family members and paid blood donors. All blood donations need to be screened for HIV, hepatitis B, hepatitis C and syphilis prior to use. Irregular supply of test kits is one of the most commonly reported barriers to comprehensive screening. Of the 112.5 million blood donations collected globally, approximately half of these are collected in the high-income countries, home to 19% of the world’s population. The blood donation rate in high-income countries is 33.1 donations per 1000 people; 11.7 donations in middle-income countries and 4.6 donations in low-income countries. An increase of 10.7 million blood donations from voluntary unpaid donors has been reported from 2008 to 2013. In total, 74 countries collect over 90% of their blood supply from voluntary unpaid blood donors; however, 72 countries collect more than 50% of their blood supply from family/replacement or paid donors. Only 43 of 175 reporting countries produce plasma-derived medicinal products (PDMP) through the fractionation of plasma collected in the country, whereas the majority of the other 132 countries import PDMP from abroad. Brazzaville, 8 June 2015 - Blood safety experts have agreed to develop robust blood transfusion services (BTS) in Ebola affected and unaffected countries to enhance preparedness for future outbreaks of infections with epidemic potential. Strengthening BTS would also have a direct benefit for tackling regional public health priorities including maternal and child mortality. During a meeting held at the WHO Regional Office for Africa in Brazzaville (Congo) from 2 to 4 June 2015, experts consolidated plans to strengthen BTS in Ebola affected and unaffected countries, and adopted a series of recommendations. These include the validation of plans to strengthen national BTS and their integration into their health systems recovery plans, the funding of BTS plans by governments and partners, the review of strategic plans for blood safety and the establishment of a regional blood safety network. "We must strengthen our blood safety services, develop human resources capacities and reinforce logistics. If the ministries of health and the governments are fully committed to supporting our plans we will go far," said Mrs. Lwopu M. Bruce, Programme Manager of the National Blood Transfusion Service of Liberia. The World Health Organization and its partners will provide support to countries at various levels, including resource mobilization for the implementation of National BTS plans, advocacy for integrating blood safety in the national health development plans, and strengthening the legal and regulatory framework for blood safety. Speaking on behalf of the Director, Health Systems and Services Cluster at the WHO Regional Office for Africa, Dr Ossy Kasilo, Coordinator, Health Technologies Programme, urged countries "to validate blood safety plans, and advocate vigorously and rapidly for their integration into their health system recovery plans. The national BTS have a crucial role to play in the response to the epidemic as long as cases of Ebola virus disease are still occurring." "Liberia is now free of Ebola and both Guinea and Sierra Leone are making progress towards making zero cases. This is the time to redouble efforts to ensure that this outbreak is brought to an end. The goal of achieving zero cases in the last countries affected by the epidemic and the establishment of robust preparedness plans in these countries and in those that are not affected by Ebola must be a top priority for all countries", said Dr Kasilo. The Brazzaville meeting also stressed the need for BTS to ensure that their voices are heard in the setting of the national health agenda, and to continue enrolment into the ongoing studies on the use of convalescent blood (CB) and convalescent plasma (CP) for transfusions of Ebola patients. The meeting was attended by BTS Programme Managers in countries affected by Ebola and those that share land borders with them (Côte d'Ivoire, Gambia, Guinea Bissau, Mali and Senegal), those with experience in the fight against the epidemic (Democratic Republic of Congo, Nigeria) and national health authorities of these countries. The health partners present at the meeting were among others: African Union, Bill and Melinda Gates Foundation-Unites States, UNFPA, Safe Blood for Africa, CDC Atlanta, and Clinical Research and Management-United States. Clinical trials of the CB and CP in Guinea, Liberia and Sierra Leone are also supported by the following partners: Institute of Tropical Medicine Antwerp-Belgium, Pasteur Institute-France, Etablissement Français du Sang-France, University of Liverpool, Oxford University, London School of Hygiene & Tropical Medicine-United Kingdom, Clinical Research Management-United States, and Doctors without Borders. Blood transfusion saves lives and improves health, but many patients requiring transfusion do not have timely access to safe blood. Providing safe and adequate blood should be an integral part of every country’s national health care policy and infrastructure. WHO recommends that all activities related to blood collection, testing, processing, storage and distribution be coordinated at the national level through effective organization and integrated blood supply networks. The national blood system should be governed by national blood policy and legislative framework to promote uniform implementation of standards and consistency in the quality and safety of blood and blood products. 41 % of low-income countries. About 112.5 million blood donations are collected worldwide. More than half of these are collected in high-income countries, home to 19% of the world’s population. About 13 000 blood centres in 176 countries report collecting a total of 110 million donations. Collections at blood centres vary according to income group. The median annual donations per blood centre is 5400 in the low- and middle-income countries, as compared to 16 000 in the high-income countries. There is a marked difference in the level of access to blood between low- and high-income countries. The whole blood donation rate is an indicator for the general availability of blood in a country. The median blood donation rate in high-income countries is 33.1 donations per 1000 people. This compares with 11.7 donations per 1000 people in middle-income countries, and 4.6 donations per 1000 people in low-income countries. 70 countries report collecting fewer than 10 donations per 1000 people. Of these, 38 countries are in WHO’s African Region, 6 in the Americas, 6 in the Eastern Mediterranean, 5 in Europe, 6 in South-Eastern Asia and 9 in the Western Pacific. All are low- or middle-income countries. Data about the gender profile of blood donors show that globally 28% of blood donations are given by women, although this ranges widely. In 16 of the 119 reporting countries, less than 10% of donations are given by female donors. The age profile of blood donors shows that, proportionally, more young people donate blood in low- and middle-income countries than in high-income countries. Demographic information of blood donors is important for formulating and monitoring recruitment strategies. An adequate and reliable supply of safe blood can be assured by a stable base of regular, voluntary, unpaid blood donors. These donors are also the safest group of donors as the prevalence of bloodborne infections is lowest among this group. World Health Assembly resolution WHA63.12 urges all Member States to develop national blood systems based on voluntary unpaid donations and to work towards the goal of self-sufficiency. An increase of 10.7 million blood donations from voluntary unpaid donors from 2008 to 2013 has been reported by 159 countries. 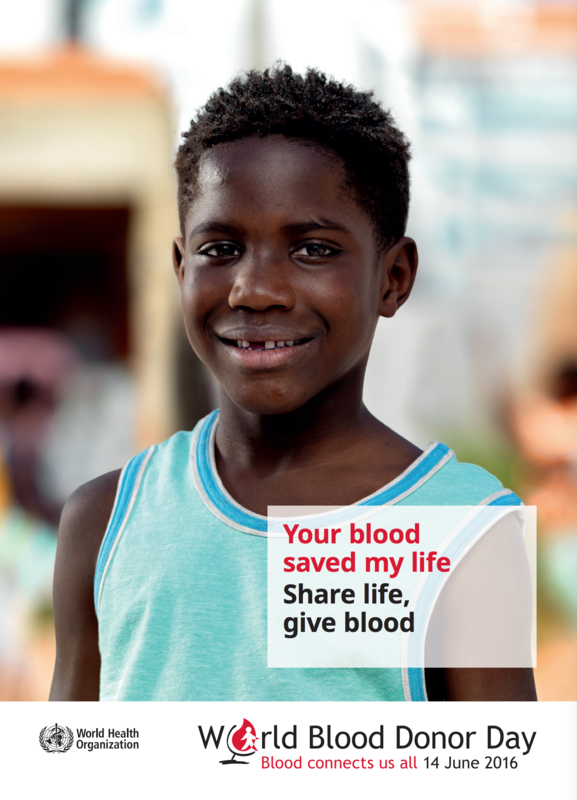 The highest increase of voluntary unpaid blood donations is in the African (85%) and South-East Asian (74%) Regions. The maximum increase in absolute numbers was reported the South-East Asia region (5.3 million donations), followed by the Western Pacific Region (2.8 million donations). 74 countries collect more than 90% of their blood supply from voluntary unpaid blood donations (39 high-income countries, 26 middle-income countries and 9 low-income countries). This includes 62 countries with 100% (or more than 99%) of their blood supply from voluntary unpaid blood donors. In 72 countries, more than 50% of the blood supply is still dependent on family/replacement and paid blood donors (11 high-income countries, 45 middle-income countries and 16 low-income countries). 24 countries still report collecting paid donations in 2013, around 1 650 000 donations in total. WHO recommends that all blood donations should be screened for infections prior to use. Screening should be mandatory for HIV, hepatitis B, hepatitis C and syphilis. Blood screening should be performed according to the quality system requirements. 16 countries are not able to screen all donated blood for 1 or more of the above infections. The prevalence of transfusion-transmissible infections (TTI) in blood donations in high-income countries is considerably lower than in low- and middle-income countries (Table 1). Blood collected in an anticoagulant can be stored and transfused to a patient in an unmodified state. This is known as ‘whole blood’ transfusion. However, blood can be used more effectively if it is processed into components, such as red cell concentrates, platelet concentrates, plasma and cryoprecipitate. In this way, it can meet the needs of more than one patient. The capacity to provide patients with the different blood components they require is still limited in low-income countries: 43% of the blood collected in low-income countries is separated into components, 78% in middle-income countries and 96% in high-income countries. World Health Assembly resolution WHA63.12 urges Member States to establish, implement and support nationally-coordinated, efficiently-managed and sustainable blood and plasma programmes according to the availability of resources, with the aim of achieving self-sufficiency. It is the responsibility of individual governments to ensure sufficient and equitable supply of plasma-derived medicinal products namely immunoglobulins and coagulation factors, which are needed to prevent and treat a variety of serious conditions that occur worldwide. 43 countries (26 high-income, 16 middle-income, 1 low-income) of the 175 reporting countries reported producing all or part of the PDMP through the fractionation (for example, domestic or/and contract fractionation) of plasma collected in the country. 106 countries report that all PDMP are imported: 18 countries report that no PDMP were used during the reporting period; 8 countries report that plasma collected in the country was sold to the manufacturers of plasma-derived medicinal products and products purchased from PMDP suppliers in the market. Around 14.3 million litres of plasma from 43 reporting countries (22 high-income countries, 12 middle-income countries and 1 low-income countries, covering a population of 2.76 billion) was fractionated for the production of PDMP during the year. This includes around 50% plasma recovered from the whole blood donations. Unnecessary transfusions and unsafe transfusion practices expose patients to the risk of serious adverse transfusion reactions and transfusion-transmissible infections. Unnecessary transfusions also reduce the availability of blood products for patients who are in need. 125 countries have national guidelines on the appropriate clinical use of blood. 72% of high-income countries have a national haemovigilance system, compared to only 28% of middle- and low-income countries. There are great variations between countries in terms of the age distribution of transfused patients. For example, in the high-income countries, the most frequently transfused patient group is over 65 years, which accounts for up to 76% of all transfusions. In the low-income countries, up to 65% of transfusions are for children under the age of 5 years. Establishment of a national blood system with well-organized and coordinated blood transfusion services, effective evidence-based and ethical national blood policies, and legislation and regulation, that can provide sufficient and timely supplies of safe blood and blood products to meet the transfusion needs of all patients. Collection of blood, plasma and other blood components from low-risk, regular, voluntary unpaid donors through the strengthening of donation systems, and effective donor management, including care and counselling. Quality-assured screening of all donated blood for transfusion-transmissible infections (TTIs), including HIV, hepatitis B, hepatitis C and syphilis, confirmatory testing of the results of all donors screen-reactive for infection markers, blood grouping and compatibility testing, and systems for processing blood into blood products (blood components for transfusion and plasma derived-medicinal products), as appropriate, to meet health care needs. Rational use of blood and blood products to reduce unnecessary transfusions and minimize the risks associated with transfusion, the use of alternatives to transfusion, where possible, and safe and good clinical transfusion practices, including patient blood management. Through its Blood and Transfusion Safety programme, WHO supports countries in developing national blood systems to ensure timely access to safe and sufficient supplies of blood and blood products and good transfusion practices to meet the patients’ needs. The programme provides policy guidance and technical assistance to countries for ensuring universal access to safe blood and blood products and work towards self-sufficiency in safe blood and blood products based on voluntary unpaid blood donation to achieve universal health coverage.